Scott Muff, the JONES partner in charge of media relations and digital media, plays a key role in the success of West’s thought leadership efforts and how those fit into the company’s overall strategy for its healthcare reminders and patient engagement solutions. 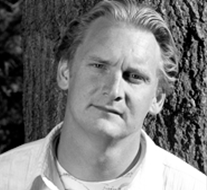 Q: JONES has been helping West place bylined articles in industry publications for several years now. Explain why this tactic is part of West’s public relations and marketing efforts? 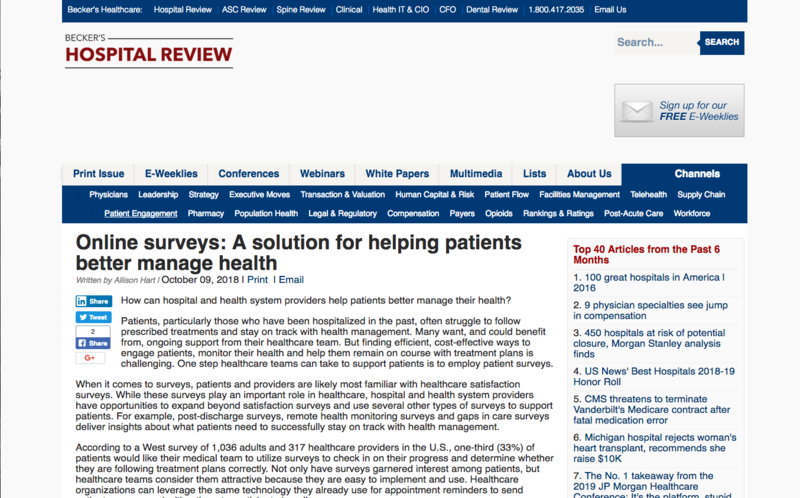 A: Contributed articles are part of a much larger strategy for West that involves creating entire content packages from surveys of consumers and healthcare providers. The idea is to position West as a thought leader and to drive traffic to West’s website. The content package begins with an in-depth whitepaper, which you can picture as the bottom of a pyramid. The rest of the package comes from that whitepaper — thought leadership articles, then blog posts, and you can think of it going even smaller into individual social media posts to help promote the articles and blog posts in order to bring readers to the website to see that whitepaper. The whitepaper is gated behind a landing page, which allows West to capture contact information when a reader completes the landing page to download the paper. Having contributed articles published in industry media has a dual advantage: It increases visibility through the readership of the publication and provides a sense of authority or respectability, as the content is being published by a non-biased publication. The thought leadership articles don’t actually mention the company by name. They can’t be promotional; they have to be informational. The only places a name is given are in the biography at the bottom of the article or in references to the study that provided the data for the article, such as in this Physicians Practice bylined article placement. Q. How do you identify publications to target? A. 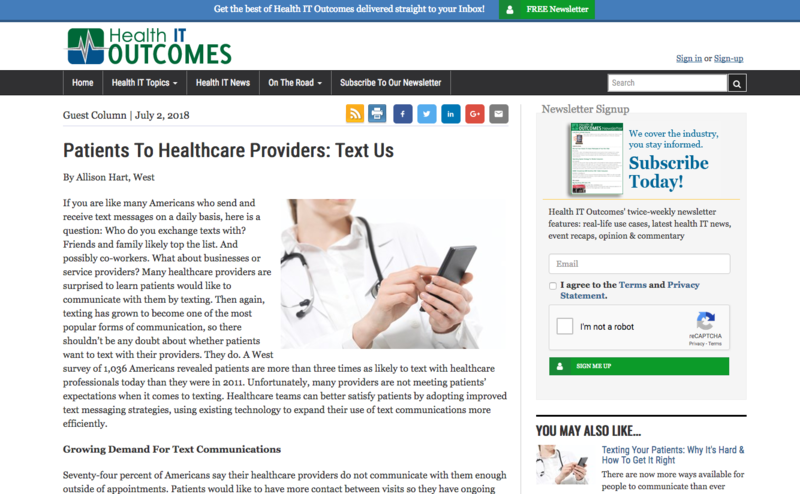 West targets the healthcare industry with its communications and patient engagement technology, so over the years we have compiled lists of publications that cover those industries, from ones targeting physicians, such as Physicians Weekly, to those tailored to dentists, healthcare management and beyond. We identify who the target market is for each topic the articles cover, and then tailor our outreach to the publications tailored to that readership. Publications, many of which are strictly online now, typically include information in media or advertising guides on their websites that identifies specifically what audience they reach and how large that audience is. Q. Describe the process of pitching and placing thought leadership articles? A. At the beginning of each campaign, we use information from the whitepaper to develop one- or two-paragraph abstracts that tell what each article could cover. Then I use that abstract to determine what type of publication would be appropriate. 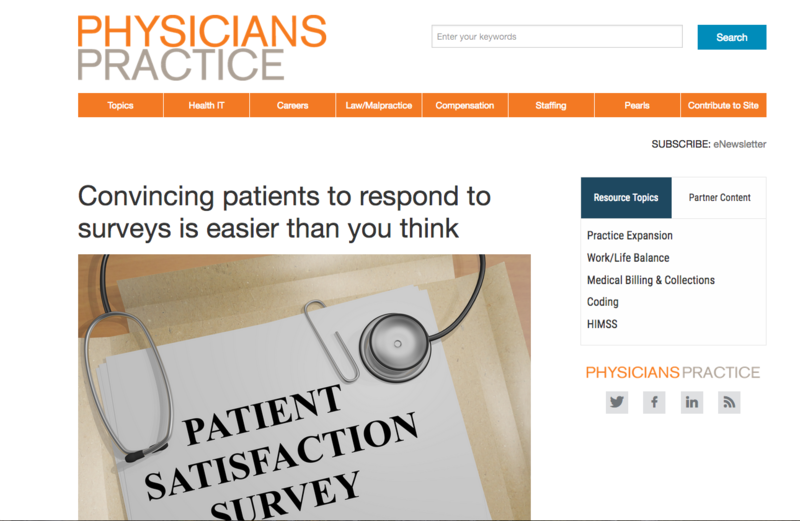 For example, if it is an article about how physicians can improve care, I target that article toward something like Physicians Weekly. 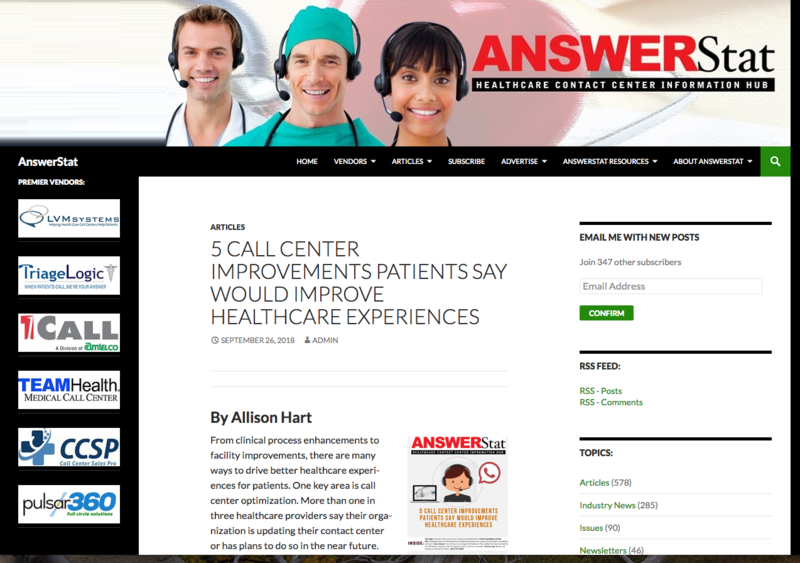 For an article about managing appointment changes, I reached out to media focused on contact centers, resulting in this placement with AnswerStat Healthcare Contact Center Information Hub. If an abstract for an article is about how mobile-to-mobile technology has improved and impacted patient experience, then I’m going to go to a technology publication to spread it out even more. 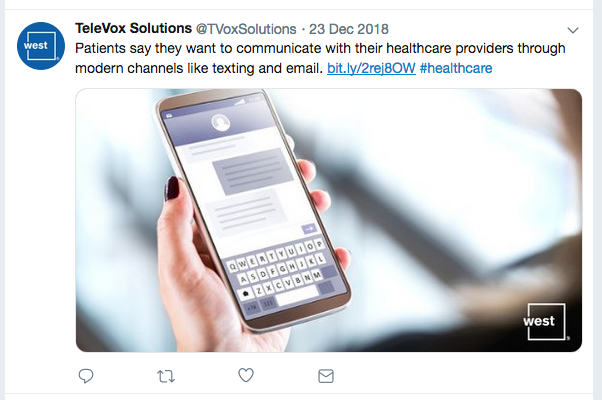 For discussion of the ROI of using mobile texting technology as opposed to having somebody call the provider, then I’ll go to a healthcare finance publication. 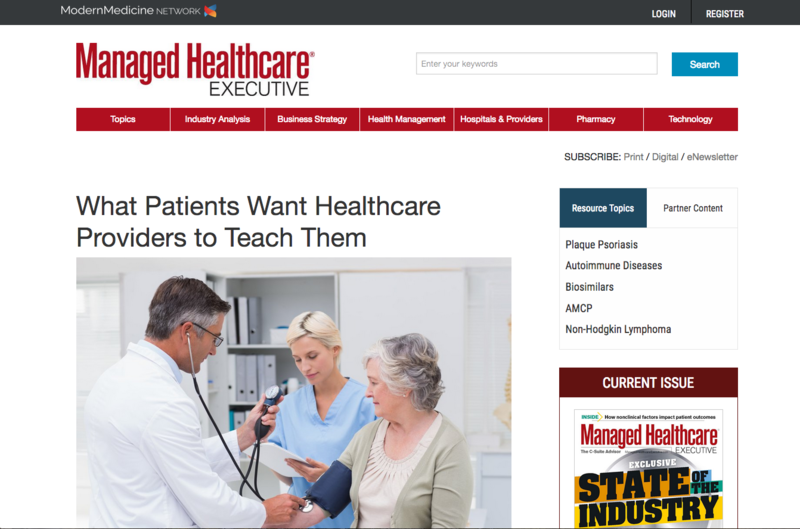 Or for an article on how to manage your team to better engage with patients, I might go all the way up to a hospital management publication, as with this article provided to Managed Healthcare Executive. I contact each publication via email to offer them the article. If they are interested in the article, then the editor/publication will usually provide writing guidelines, and we write the article accordingly. Some are very specific about style guidelines, citations and other details; others may simply specify a word count. All are very specific about the articles being vendor neutral. As you do enough of these, you get to know what they are looking for. Our writing and content creation staff at JONES writes the articles, and West provides edits and feedback to JONES before they are sent to the editor for final changes and/or publication. Some may come back with changes or questions. You want to give them whatever they want so it gets published. Once it is published, then the social media part of it kicks in. Q. What is your success rate? What leads to such strong success? A. There is a lot of work that goes on behind the scenes. Very rarely do you find that the first email you send out is accepted by a publication. I reach out to five or six publications on average to get an article placed. In 2018, we successfully placed 13 contributed articles outlined in West’s campaign strategies. A lot of the success in placing articles is determined on whether you are going to the right publications to start with. You want to make sure their target audience is going to be interested in that topic. Another big part of your success is how often you’ve had success with these publications in the past. We have a proven track record of providing quality content and unbiased articles. 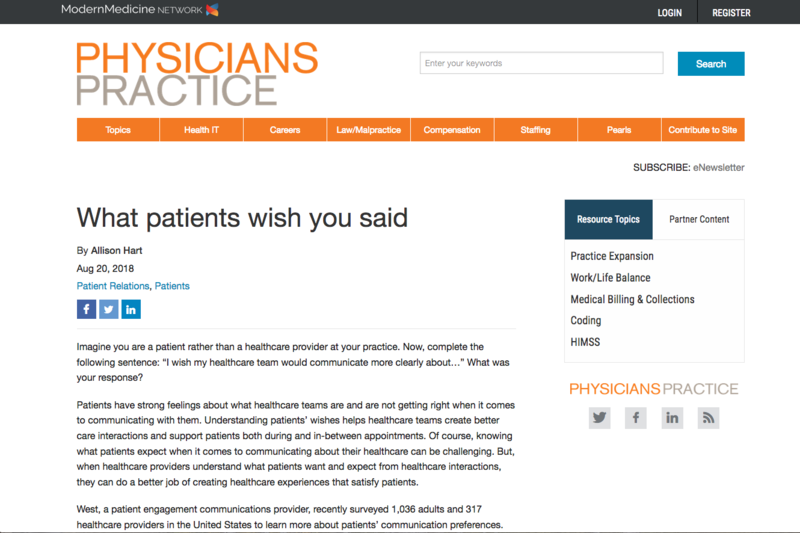 We’ve never made the mistake of having a self-promotional article, which is one reason publications like Physicians Practice are quick to accept our proposals. While the online nature of today’s media means they can use more content than print publications could in the past, at the same time, they aren’t going to want to have an article from the same company and the same person every month. I seldom reach out to the same person twice in six months; the rare exception would be if we pitch a package or series of articles that work together. Q. What makes articles from JONES and West successful? A. One of the things editors and publications really like about what we’ve been doing with West is that we are using the survey data we’ve collected for West. They love stats and numbers they can point to. It’s solid; it’s not an opinion, it’s a fact. By working from those statistics, we can create articles that provide advice to readers. Infographics, like the one included in this article accepted by Becker’s Hospital Review further leverage the statistics from original research. If you have a good stat, then use it. Q. How has West optimized those placements? A. West’s contributed articles are an integral part of a larger campaign, and we work closely with them to ensure other marketing elements take advantage of the expanded exposure and thought leadership developed through the articles. West highlights the bylined articles in its own blog posts, and then uses social media to share both those posts and the articles themselves, eventually linking back to the whitepaper that was the base of the pyramid and the foundation for the campaign. When readers and social media followers come back to the West website, they can provide contact information to download the whitepaper or to get a blog subscription. 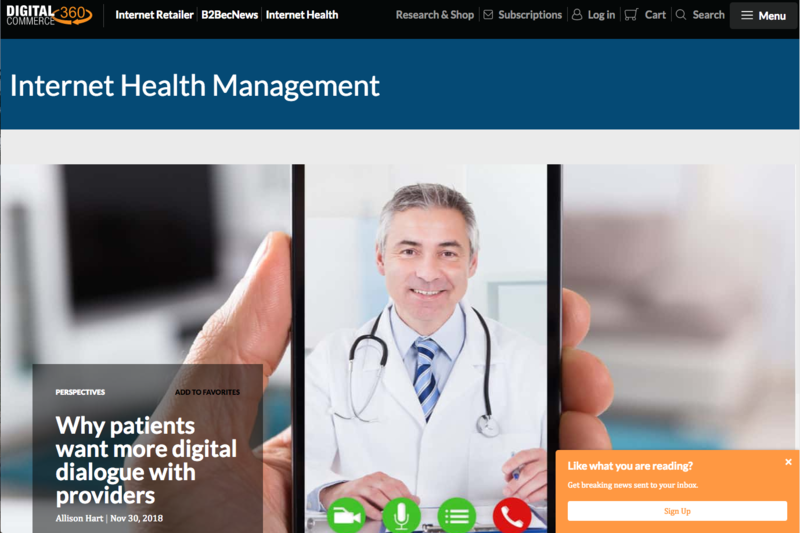 The following examples show the social media posts used to promote this article published by Digital 360 Commerce in its Internet Health section. The end goal for all marketing and public relations is to create sales. When a new customer says they learned about West or its solutions from an article we successfully placed, it really shows how the communications team is contributing to the bottom line of the company. JONES has worked closely with us to create comprehensive campaigns that take full advantage of the data and opportunities generated through our research and surveys. 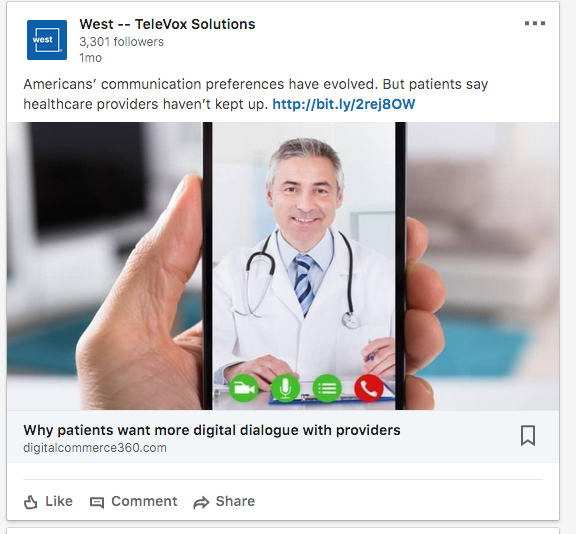 Contributing bylined articles to industry media outlets is a key part of keeping West’s services and expertise in the minds of our potential customers and highlighting our role as a leader in helping healthcare professionals make the most of technology to improve their patients’ health and their own businesses. This integration of public relations and marketing is something JONES understands well. Their ability to bring a combined strategy to the table and executing all aspects of it flawlessly sets them apart from other marketing agencies. We’ll be sharing more details in later blog posts on the complete content packages JONES and West have crafted which include these thought leadership articles. Subscribe to the Inbound Accelerator now to ensure you won’t miss our follow-up posts. Could your content reach more readers and expand your brand awareness through the use of contributed articles? We wrote the book on getting your CEO published, literally—download it here to incorporate bylined thought leadership articles in your own marketing campaigns today.